First up was the new cocktail offerings. While it might look like a towering glass of iced tea, the Cowboy Bourbon Peach Tea packs a punch of sweet with a kick of bourbon. 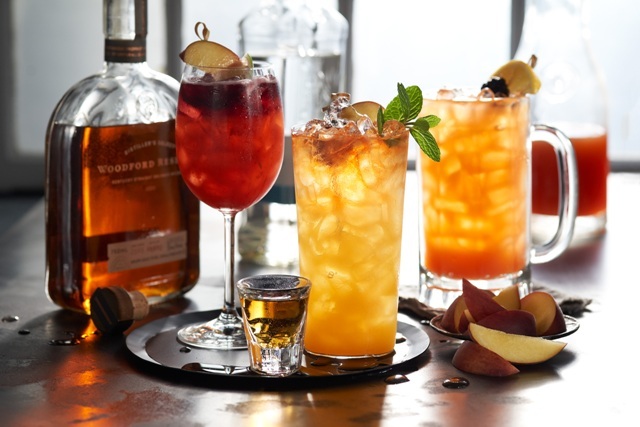 A hand-shaken blend of Tea Liquor Pre-Mix, Woodford Reserve Bourbon, Monin Peach Puree, fresh lemon mix and a float of iced tea, this cocktail will satisfy even those not keen on Bourbon. For a slightly less-sweet way to get things started, the Peach Berry Sangria-Rita is a fruity dance of tequila and red wine. Served in a wine glass, the ruby red drink is a mix of El Jimador Silver Tequila, peach puree, strawberries and fresh lime mix. Ménage a Trois red wine tops off the cocktail along with a juicy peach wedge and lime. The new menu also offers a non-alcoholic Orchard Summer Tea, a mix of strawberry-raspberry lemonade, iced tea and peach puree. After stuffing our faces with fresh-baked bread, we dug into the new summer special, a choice between an 8-oz. sirloin or 6-oz. 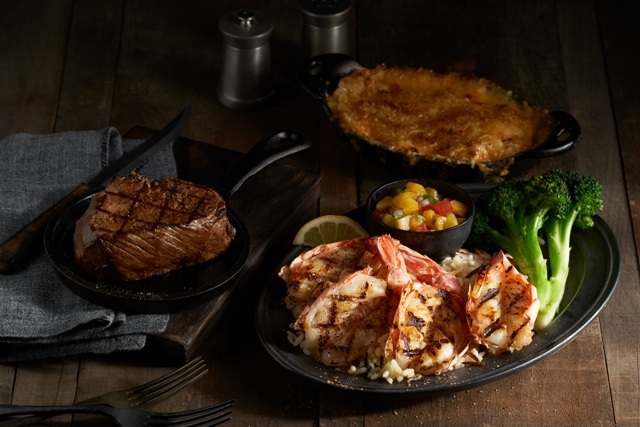 center-cut filet, and accompanied by four Argentinian pink wild prawns served over a bed of Western wild rice with a side of peach pico de gallo. While the sweet fruit plays a part in this bright medley, the pico de gallo adds an appreciated kick of spice to the dish which pairs perfectly with the giant prawns and buttery wild rice. The special also includes two classic sides from its varied choices. We dug our teeth into the generous serving of asparagus and fresh house salad but for a more comforting accompaniment, opt for something like the creamy mac-and-cheese or baked potato. End the meal right with the new peach and cherry cobbler. The warm, ooey-gooey treat hides a heaping serving of juicy yellow peaches and sweet dark cherries under a thick and buttery crumble topping. A mound of vanilla ice cream tops off this comfort dessert that doesn’t skimp on any of the ingredients.